UPDATE: Maybe they don't like attention or public scrutiny; Palo Altans Concerned About HSR have now gone members-only. Before Proposition 1A was passed last November, the Palo Alto city council strongly supported the project, passing a unanimous resolution in favor of HSR at their October 6th meeting. That was before the impacts became generally known to residents, and especially to abutters from Southgate, one of the neighborhoods most likely to be impacted (see Focus on: Palo Alto). Residents of Palo Alto are becoming increasingly concerned about the impacts of HSR on their community. They have started a new mailing list, Palo Altans Concerned About HSR, where there is lively discussion about organizing the local opposition. The discourse is civilized and intelligent, in contrast to certain corners of the blogosphere and Palo Alto's Town Square forums. It is SO IMPORTANT that we stick to unembellished facts. If you’re not certain about an aspect of the HSR project, either phrase it as a potential possibility or don’t mention it at all. We lose credibility if we’re accused of being alarmists, spreading false information or acting out of NIMBYism. Try to avoid any topic that leads in that direction. Remember, our own actions and reactions are potentially newsworthy. Let’s not make the news for displaying any of the above behaviors. Opponents are trying to get their views aired by the local press, radio and TV; for this purpose, they are planning a march through downtown to City Hall prior to the next council meeting on Monday, March 2nd, when Palo Alto's comments on the scoping of the HSR EIR/EIS will be discussed. (See agenda and especially the city manager's full report with draft scoping comments.) Some Palo Alto residents are characterizing this issue as "the most critical moment and the most critical issue in a generation". Meanwhile, the CHSRA hosted another community meeting in Palo Alto tonight (Thursday, February 26th), another in a long list of community meetings taking place up and down the peninsula. It is sure to be discussed by the Palo Altans Concerned About HSR. UPDATE 2: San Carlos has also posted their draft scoping comments for their city council meeting of Monday 2/23. The letter includes a concern about vertical clearances at the Holly St. underpass, which the Daily News (Redwood City edition) quickly blew out of proportion by proclaiming: Major High Speed Rail Dilemma Discovered in San Carlos. If that is the biggest problem we have on the peninsula, the high speed rail project really must be in great shape! This area is smack in the middle of the future site of the SamTrans Transit Village, a Transit-Oriented Development that threatens to intrude upon the right of way and constrain the configuration options for high speed rail. Transit agencies at their best! UPDATE: Menlo Park has posted their draft scoping comments for consideration at the city council meeting on Tuesday 2/24. The city of Mountain View posted their draft scoping comments on the peninsula high speed rail EIR/EIS, to be reviewed / approved at the next city council meeting on Tuesday. The Mountain View packet also includes a draft of the "We The Mayors" letter presenting peninsula communities under a united front. As further described in a Daily News article on Saturday, an alliance of peninsula communities is being formed outside of the Peninsula Corridor Joint Powers Board (Caltrain), which has heavy representation from the cities of San Francisco and San Jose, cities whose interests will not necessarily align with those of the peninsula communities in between. The town of Atherton also posted their draft scoping comments (see Item 19, pp. 13-42) on the peninsula EIR/EIS for consideration at their 18 February council meeting. Atherton had originally submitted comments on the Bay Area regional EIR/EIS, to which the CHSRA responded (refer to Chapter 22, page 101, comment letter L025). Atherton's scoping letter includes point by point rebuttals to the CHSRA's comments and a forceful argument for tunneling. Atherton is of course one of the plaintiffs in the lawsuit to overturn the regional EIR/EIS's CEQA certification, which could re-open last summer's decision to route HSR through Pacheco Pass (and Atherton) instead of Altamont Pass. The court documents pertaining to this lawsuit are available on the Sacramento County Superior Court's document server; search under case number 34-2008-80000022. Finally, Palo Alto has established on their city website a new section on high speed rail. There's not much there yet, but a good place to keep an eye on. Pretty catchy title, eh? That was the headline blaring from today's front page of the Daily Post (Palo Alto edition), a local free newspaper. The tag line: "New rail line threatens old tree." As you'll see, the journalistic standards are right in line with the price. Construction of a high speed rail line alongside the Caltrain tracks in Palo Alto could threaten El Palo Alto, the 1069-year-old redwood tree after which the city is named. (...) If the new rail line is built to the east of Caltrain, El Palo Alto would have to be cut down. If the rail line went to the west, it would mean at least part of the Stanford Park Hotel would be eliminated, and the tree still might not survive. Excavating for a sound wall footing or other reason close to the tree would probably result in tipping the tree's viability over the edge. Even if deep cuts were vertical without leaving the ROW, they may have catastrophic effects. (...) There simply are not roots where a typical flatland tree would have roots. Root and soil removal could result in an irreversible decline or even mortality whether by health or weakening the tree's stability or catastrophic whole tree failure in any direction. With the debate over HSR heating up in Palo Alto, the Daily Post should refrain from further inflaming passions with poorly-researched, sensational stories like this one. Expanding those tunnels could cost tens of millions of dollars (...) Some of the rail bonds could be used to expand the tunnels or bore new ones. The cheapest option would be to cut the Port a $25M check so that they go away forever. Better yet: would somebody please put this agency out of its misery? UPDATE: a useful cross section drawing of the tunnel in question, and the various loading gauge dimensions (the relevant clearance for autoracks is AAR Plate H). How much rail traffic can we expect on the peninsula by the year 2030? Both the California High Speed Rail Authority and Caltrain have projected ridership figures that allow us to estimate overall traffic levels on the peninsula corridor. Ridership figures are used to sell transportation projects to the public; more often than not, they are slightly overstated. Accordingly, consider the analysis below to be an upper bound. Today, Caltrain runs 98 trains per weekday, with a peak rush hour capacity of 5 tph (trains per hour) per direction, or 6400 seats per peak hour, counting both directions. Off-peak capacity is 2 tph per direction, and weekend capacity is just 1 tph per direction. Caltrain has about 37,000 boardings per weekday. At 98 trains/day x 640 seats/train, this figures to a 58% load factor (the average proportion of occupied seats) assuming all trips go the full length of the line. In practice, the average load factor is likely under 50%, although the most popular rush hour trains do approach 100% (i.e. standing room only). Caltrain plans to grow its ridership, independently of high speed rail, by using electric rolling stock that can operate faster and more frequently. Their Caltrain 2025 plan calls for a peak capacity increase from 6400 seats/hour to 11000-16000 seats/hour by the year 2025. Assuming trains remain at the same seating capacity, this implies an increase in peak traffic from 5 tph to 9-12 tph per direction. Total capacity would roughly double, to about 200 trains per weekday. The California High Speed Rail Authority has published various ridership estimates over the years, the latest of which is contained in their 2008 business plan. The chapter on ridership and revenue estimates that by 2030, the peninsula corridor will see 8 - 10 tph per direction during six peak hours (6-9AM and 4-7PM) and about 6 tph per direction off-peak. That's a total of roughly 220 trains per weekday or 1300 trains per week. Interestingly, there are no trains that skip San Jose or terminate at San Jose, which neatly sidesteps the rivalry between San Francisco and San Jose for the title of most important Bay Area destination. Let's add it all up. 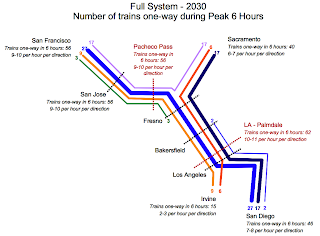 Since peak hours for Caltrain and HSR will coincide with morning and evening rush hours, it is conceivable that peak traffic on the peninsula could reach 20 tph in each direction by the late 2020's (9-12 tph Caltrain and 8-10 tph HSR). Off-peak traffic would be closer to 10 tph in each direction (4 tph Caltrain and 6 tph HSR). Total weekday traffic would be about 420 trains (including both directions), an increase of four times over today's traffic levels over a span of two decades. To an observer at any given place along the peninsula corridor, there would be a train passing by on average every 1.5 minutes at rush hour, and every 3 minutes off-peak. While the 20 tph figure is similar to that achieved by BART on two tracks, the peninsula corridor will be very different: it will support five different classes of service, each running at a different average speed. Mixing these different classes of traffic requires frequent overtaking, which explains the requirement for four tracks throughout most of the peninsula corridor. 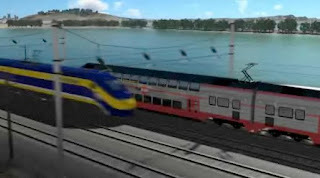 In San Francisco, there is a different implication to this 20 tph peak figure: since all trains must run at the same speed in the final approach to San Francisco, as dictated by the tight curve radii in this area, they would no longer need to overtake each other. Theoretically, running 20 tph through this speed-restricted area could be done on fewer than four tracks-- possibly just two! With homogeneous speeds, BART does it every day through the transbay tube, meshing together trains from four far-flung lines into a 20 tph trunk with just two tracks. Similarly, Amtrak and New Jersey Transit run up to 24 tph each way on the two tracks under the Hudson river. In both cases, there are efforts underway to increase the number of tracks, but it does give you a feel for the maximum throughput of two tracks when traffic is perfectly homogeneous. When a train reaches the end of the line in San Francisco, it needs to be cleaned, serviced and provisioned for its next trip. From arrival to departure, these operations typically take about an hour on other rail systems. If time is of the essence, which it will be in San Francisco, the turnback time might be reduced to about 30 minutes, very low by rail standards and commensurate with airline operations. The Transbay Transit Center is planned to have just six platform tracks shared by HSR and Caltrain, a very small number by international rail terminal standards. If a train occupies a platform track for just 30 minutes at a time, the maximum turnback capacity of a six-track terminal is 12 trains per hour. This highlights another interesting feature of San Francisco rail operations: overall capacity into and out of the city will be constrained by terminal turnback capacity, and not by track capacity. You could build a six-track approach into San Francisco, but you still couldn't squeeze more trains in and out of the city. Turning some trains, most likely Caltrain services, at another station. The existing Caltrain terminal at 4th & King streets might be retained for this purpose. Turning some HSR services at San Jose. This has the added benefit of reducing traffic on the peninsula. Whatever happens between now and 2030, it is likely that the peninsula corridor will be hardly recognizable when compared to its current state.